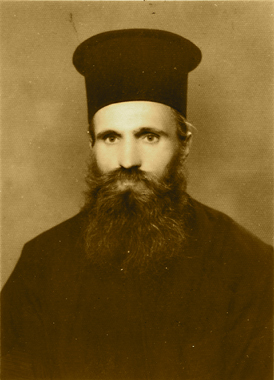 The Kingdom of God and the reclusion of the Desert Fathers had had an appeal to Elias since early childhood and in the summer of 1932 when his relatives suggested that he should study theology and become a priest, he declined their suggestion, convinced that God had higher expectations of him: ”No, I shall become a monk”, he told them. One year later, as he was doing field work, he prayed that God should show him what path to choose in life and he suddenly heard a voice from above that told him the answer to his inquiry, ”Monachism!”. In the summer of that same year, on a Sunday, having received the blessing of his confessor, he packed his religious booklets and the icon of the Theotokos from his parental home and, under the inspiration of the Holy Ghost, went to Neamt Monastery whose congregation professed him and alloted him chores in the library and in the sickroom of the establishment. His confessor was Sabbas (Sava), a Macedonian who looked up to the Romanian monks who were abiding in the Holy Land. During the daytime John would go about his chores in the skete and the sickroom and at night he would shut himself in his cell and pray or read the Gospel and the wirtings of the Holy Fathers. Having learnt Greek, he translated many patristic writings which then he used to edify himself spiritually and those who sought him out for advice. He also had the gift of writing spiritual lyrics which he offered to the Romanian monks and pilgrims who came to the Holy Land to rever the Holy Sepulchre. On the most important feast and fast days, John and Joanichios would perform the Divine Liturghy in the paraclise of Saint Hannah’s Cell and receive communion, and then gratefully give thanks to God . In his free time he would sit in the light, at the entrance of his cave, where he would write spiritual lyrics and translate patristic teachings from Greek. His daily meal consisted of biscuits, olives and figs and a few cups of water. At night he would sleep a few hours on a plank with a stone for a pillow. This page was last edited on October 24, 2012, at 16:04.